Volume #2? Sadly I didn't catch the first one that was held on June. 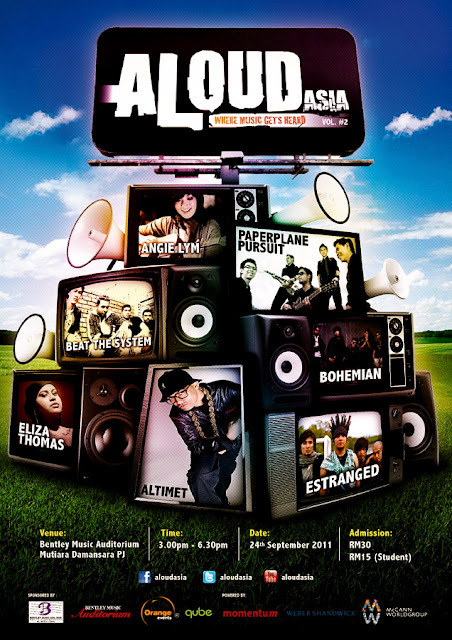 AloudAsia volumes aim to bring Malaysian music to the masses by providing Malaysian artists with an opportunity to have their music heard. Each volume will comprise of both established local and undiscovered artists providing everyone an equal opportunity to have their music heard. In between months, ‘Open AloudAsia’ will hosts auditions to source for undiscovered opening acts for the upcoming volume. Special 15% discount will be given to Borders Rewards Card members. Valid until 24 September 2011. So I'll see you there this saturday! P.S. K-town Clan will be launching their new album supported by Aloud Asia. The launch will happen immediately after the event from 8-10pm.